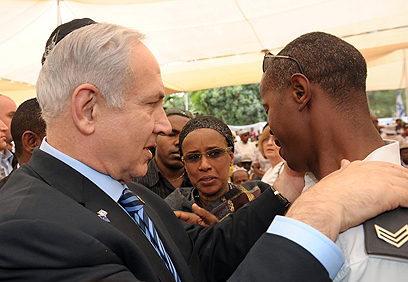 The moving memorial ceremony for the Ethiopian Jews who died en route to Israel struck a particular chord with Prime Minister Benjamin Netanyahu who got up from his seat during the ceremony and hugged Shai Dambel Wassa who spoke on behalf of the families. While Ethiopian protests against discrimination and racism continue outside the prime minister's residence in Jerusalem, Netanyahu chose to highlight the integration of young Ethiopians in Israeli society in his speech, but noted that many challenges still remain. "First and foremost we must root out the racism and discriminatory behavior you encounter," Netanyahu said. 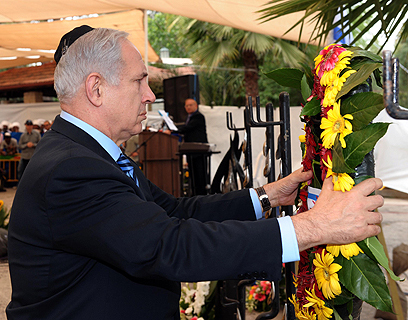 Netanyahu added that "We are fighting against it with all our might. In the State of Israel there is no room for racism and boycott – not in Israel and not against it." Netanyahu also regretted that Ethiopian heritage and history is not well known among Israelis, and promised this error will be corrected through educational programs. "The story of the Ethiopians who perished on their journey to Jerusalem is one of the most fascinating an heroric stories in the history of our nation," said Netanyahu. "This proves how deep your connection to Israel is. The more hardships you encountered, the more your love for Zion grew." See all talkbacks "State honors memory of Ethiopian Jews"